With its many luxury touches, the 1955 SUPER looms as the brightest star of the medium-price field. It has clean new lines front to back -- new hooded headlamps and tail lights -- four fender ports -- a sweeping new curve of rear window in the 4-Door Sedan -- and added headroom in Riviera and Convertible models. It has a walloping big increase in performance -- up 30% over last year -- with its new 236-horsepower V8 engine and the smooth, surging acceleration of Buick's new Variable Pitch Dynaflow. 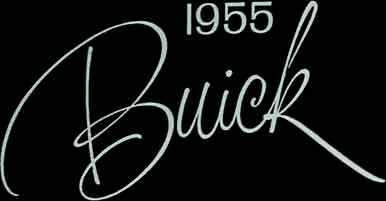 It has Buick Safety Power Steering as standard equipment. It has the world's most luxuriously buoyant ride. It has the industry's roomiest interiors, upholstered in beautiful new fabrics and trim. And the SUPER brings you all this at a price that makes it the stand-out buy of its class in 1955.